Former PSV youth player Abdenasser El Khayati went abroad, first to Olympiakos Nicosia in Cyprus in July 2012 and one year later he showed up at KV Turnhout in Belgium. He did not play an official game for either of these clubs. Finally he signed a contract at English side Burton Albion in January 2015 until the end of the season. 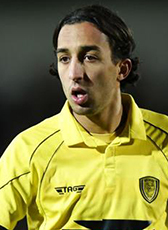 El Khayati and his fellow Dutchman manager Jimmy Floyd Hasselbaink had a great season and Burton Albion went on to become champion of League Two. In June 2015 El Khayati signed a new two-year deal and started the new season in League One, the third level in England. In January 2016 El Khayati moved to Championship side Queens Park Rangers for a fee of 350.000 English Pounds on a deal until 2018. At QPR El Khayati was reunited with his former coach Jimmy Floyd Hasselbaink. In January 2017 he returned home for a loan period at ADO Den Haag for the rest of the season. His stay in The Netherlands was successful. In summer 2017, the club decided to contract him on a permanent deal until 2020.